The bones between the fingers & the wrist (carpal bones) are called the "metacarpals". The first joint where our fingers connect to our hand is call the metacarpal-phalangal joint, or MP joint for short. 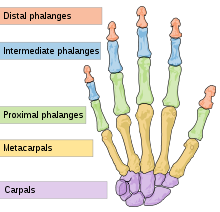 ("Phalange" is a fancy name for finger). Movement at this joint is needed for grasping and holding. In each finger, there are three "digital bones". Each bone is connected to the next by an "interphalangal joint". The interphalangal joints are named by whether they are close to the hand (the proximal interphalangal joint, or PIP joint for short) or further away from the hand (the distal interphalangal joint, or DIP joint for short). Movement at the PIP and DIP joints is needed for precision (such as getting/holding small items), in-hand manipulation (moving an object in our hand), translation (moving an object from our palm to our fingertips), prehension grasp (holding a writing/coloring utensil) and fine motor coordination (using our fingers to manipulate things in our environment, such as buttons, containers, etc). The most important movement that the finger joints perform in bending into the hand (flexion) and straightening away from the hand (extension). But, in addition, they also move inward towards each other (adduction) and outward away from each other (abduction). The most important player in fine motor skills, in my opinion, is the thumb. The thumb works with the index and middle fingers to perform most of the fine motor tasks that require movement, control and precision. This is often called "radial movement". The ring finger & pinkie finger work together with the thumb to perform most of the fine motor tasks that require strength. This is often called "ulnar movement". As infants and toddlers, we use our hand as a whole unit. As our muscles strengthen and movements become refined - we develop an ulnar/radial separation of the hand - allowing us to perform tasks that require precision or tasks that require strength with more accuracy. The thumb also connects to the wrist at a carpometacarpal joint, or CMC joint for short. The CMC joint performs a variety of very important movements. The CMC joint of the thumb can flex, extend, adduct and abduct. In addition, the CMC joint performs an essential movment called "opposition". Opposition is the movement that consists of the thumb moving across the palm to make contact with the fingers. It is the most important movement for functional grasp. The thumb also has a metacarpal (MP) joint, which also flexes, extends, adducts, abducts and opposes. Finally, the thumb has a interphalangal joint, or IP joint for short, that flexes and extends. The area of skin between the thumb and the index finger is often call the "thenar webspace". What the "webspace" looks like when a child is performing fine motor tasks is often a good indicator of muscle strength and fine motor control. But we'll get into that later. Muscles of the hand are divided up into two types: the intrinsic (or inner) and the extrinsic (or outer) muscles. And then those types are even further divided! The intrinsic muscles are divided into the thenar muscles (on the thumb side), the hypothenar muscles (on the pinkie side), the interossei muscles, and the lumbrical muscles. The most important thing to remember about the intrinsic muscles is that they are responsible two very important things : 1. strength (i.e. for grasping and squeezing) and small, precision movements. The extrinsic muscles start from the forearm and go all the way to the fingers. They are responsible for bending and straightening the fingers. The movements aren't as precised or controlled as that of the intrinsic muscles.